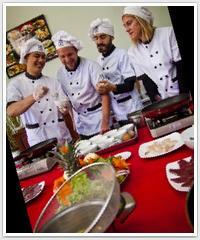 At Hanoi Cooking Centre we care about all things culinary. Located in Hanoi's famous old quarter and close to picturesque Truc Bach and West Lake, Hanoi Cooking Centre is the only purpose built cooking school in Hanoi. We offer hands-on cooking classes and short courses all designed by chef Tracey Lister, co-author of KOTO - A Culinary Journey Through Vietnam. At Hanoi Cooking Centre you can take part in: - Vietnamese and International Cooking Classes - Street Eats and Market Tours - Corporate Team Building Classes - Cooking for Kids Our classes are scheduled every day in the morning, afternoon and early evenings. Hanoi Cooking Centre classes are an interactive and fun way to learn new cooking skills and experience the tastes and textures of the cuisine of Vietnam. You will prepare dishes under the guidance of experienced chefs at your own work station and each workshop will conclude with tasting the food you have prepared, accompanied by local beer or wine, in our comfortable dining area. All guests will receive detailed recipe cards to take home at the end of the class. Our classes at "4Tours Center for Culinary Arts" are largely a basic introduction to Vietnamese cuisine; our focus is on active participation and having fun whilst also getting an insight into the role of food and drink in everyday culture. 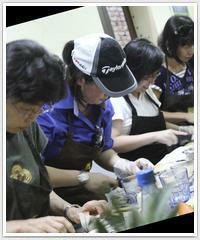 You’ll find our classes a great curtain-raiser to the Vietnamese market and the scents and tastes that it boasts. Located in very peaceful place (garden between busy Hanoi).It brings you not only the feelings of very different Hanoi but also the different in each dish you will hands- on in our cooking class.